Kelly: Tell us a little bit about your business. Danetha: I’m a financial strategist. I love helping small businesses streamline their financial needs. I’m also a sole practitioner (which means I have no employees, and currently no consistent contractors). I bill my clients on a fixed-fee or per project basis — I haven’t touched a time clock or time tracking app since I went into business for myself three and a half years ago! K: What was your first introduction to TSheets? D: It was actually on Twitter. QBO Chat to be specific. It was October 2014 — right before the first QuickBooks Connect. I was new to the ProAdvisor community and I remember loving the conversations I would have with @TSheets. I think we actually first connected over happy hour (in true TSheets fashion). I thought the company seemed really cool, and I loved the energy behind the brand. K: That was your digital introduction, what was the first in-person touch? D: That was at QBC 2014. Of course, I felt like I already knew the whole team because of our social engagement, but I was totally blown away by the in-person experience! Every single person I met had an incredibly genuine attitude and just seemed so excited to be there. They were exactly the type of people (and brand) I wanted to be building networking with at an event like that. After I went to the TSheets party, I knew I had to get to know this company better! K: Ok, so sounds like you were totally sold on the BRAND, but as an accountant that had moved away from hourly time tracking, what was your initial thought about the product offering? D: Well, I loved the marketing, and I obviously loved the branding, but wasn’t sure that the product would fit with my business. I don’t track my time, at all, and my business model doesn’t include taking on employees (at least, not for the next few years). Most of my clients are also solo-pruners… so, to be honest, I didn’t immediately see the fit. K: Did you have PMTD (Post Manual Timesheet Distress) from a past job? D: Yes! Before striking out on my own, I was an hourly employee in the accounting department of a large resort and catering company. This was several years ago, and I will give that company credit, at least they weren’t using paper timesheets — but the only time tracking solution on the market at the time was really clunky. Even worse, it required returning to a physical workstation to clock in, clock out, or go on break (not ideal for an industry with host employees running all over town to execute on catering deals). I worked in accounts receivable and accounts payable, but one of my good friends was the payroll manager. I can’t tell you how many times she had to call employees, or even chase them down, just to get them to physically return to the resort’s headquarters and CLOCK OUT! Thinking about it now, it seems laughable. Which reminds me, I should introduce her to TSheets! K: That sounds like a terrible, but not uncommon, work situation! Was that work experience part of the reason you moved away from hourly billing when you started your own business? D: Yes, exactly! Ever since I started my own company, I totally transitioned away from time tracking. I did not want to waste my time going through that process again. K: Gotcha! Ok, so be honest, when we first approached you about taking this 30 day time tracking challenge, what went through your mind? D: One of my core values is “freedom,” and for me, tracking time seemed to be in contradiction of that. When you first asked if I’d track my time for 30 days, I was initially fine with it (I love reviewing new apps and immersing myself in technology), at the very least, I was open to giving it a shot. But when the rubber hit the road and it was time to start the 30 days challenge, I won’t lie — I was not excited. K: Not surprising, some of our own employees have that reaction initially! Walk me through the stages of tracking your time over the past 30 days. D: Hmm… I’d call stage one “Resistance.” I set the account up, turned on the clock in and out reminders, and then proceeded to completely ignore them. Somehow, taking five extra seconds to open the app and clock in (when, in all reality, I’d actually been working for several hours at that point) seemed unrealistic. But then, after my first full week, I got my weekly digest from TSheets — and it said I’d worked zero hours! That was eye opening for me, obviously it wasn’t true! So, the next week, I gave myself a little pep talk and made a more conscious effort to track my time. After just a few days, I was getting better at clocking in when I got the email reminder — and I was finally racking up some hours. Knowing that, I would call stage two “Awareness.” The second week brought with it the realization that my days were completely scattered! Week three I would call “Organization.” I got better at chunking my time into linear activities… in other words, I’d dedicate time to one activity and actually finish what I started. It seems so simple, but I didn’t realize I hadn’t been making a concerted effort to do that! Finally, week four was the “Streamlining” stage — I got even better at planning my weeks (I even scheduled time on my Gmail calendar to coordinate with the job codes I’d entered in TSheets) and making efficient use of my time. I had so many aha moments — it was actually pretty fantastic. K: Awesome! So what was your biggest aha moment while doing this 30-day challenge? D: I had several! I realized I wasn’t dedicating any time to sales (read more about the course I’m launching to help other business owners avoid stumbling into this same pitfall here), my schedule was really erratic, and I wasn’t channeling my creativity efficiently. With TSheets, I can create a task, assign an hour to it, actually complete it, and then wrap it up and move onto the next thing! I feel so much more accomplished at the end of the day. K: What would you say to a business owner (maybe another sole practitioner) who is considering using a solution like TSheets to track their time internally? D: If the idea scares you, it probably means you need to take a closer look at it. If you aren’t ready to commit to tracking time “forever,” use an option like TSheets in small, strategic bursts. Try it for 30 days straight; use it as a way to bring awareness to your habits. Where are you lacking efficiency? Are you pricing your services correctly? Are you profitable? If you don’t want to continue tracking time “forever,” you can use a solution like TSheets to conduct a quarterly “health check-up” for your business and your time management skills. K: Would you recommend TSheets to your customers? D: Yes, definitely. This gave me some serious lightbulb moments in terms of the customers I already have, and I quickly discovered that the people I originally assumed would not be a good fit for TSheets actually are! The TSheets product and the TSheets team are literally the best at what they do. End of story. Want the full scoop on Danetha’s 30 day time tracking challenge? Click here to read the whole story in her own words. Interested in becoming a TSheets PRO like Danetha? 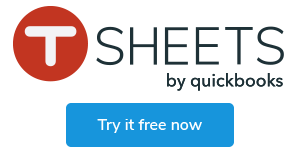 Learn more about the PRO program and find out how you can get TSheets for FREE!